The latest update by Instagram has double the fun for its users. It is now going to allow its users to go live with friends. The feature has been rolled out as a trial to a randomly selected group of users but it will available to the general public in no time. Going live with a friend does not mean he/she must be next to you. This feature allows users to invite their friends to join their live broadcast from their own device. Upon inviting someone for the broadcast, the screen will split into two parts. This will give half of the space on the screen to a user’s friend. The other people will comment and follow along as usual. 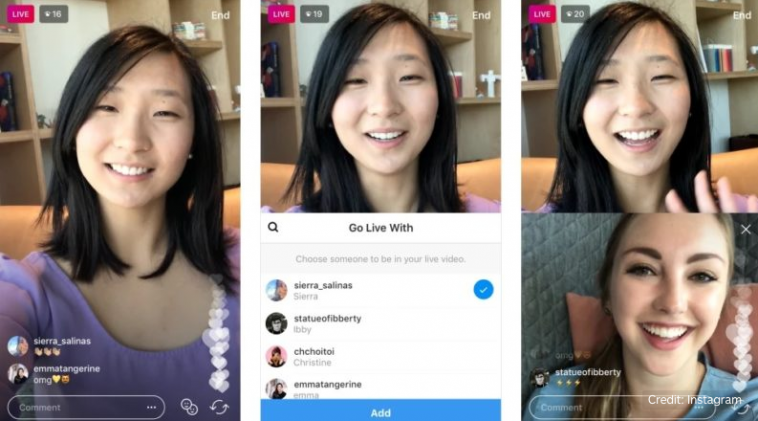 During a live broadcast, a user can add or remove any of their four friends at any time. A shared live stream proved to be both a product and a technical challenge for the live team. The Instagram team wanted to make the broadcast split screen so that users can communicate more directly and openly with each other. The invitee will get a pop-up notification and will need to accept before joining the broadcast. This feature will surely help to balance the formality of staged posts. This will help people to share very casually and in future, the live news interviews or comedy skits may be aired on Instagram.